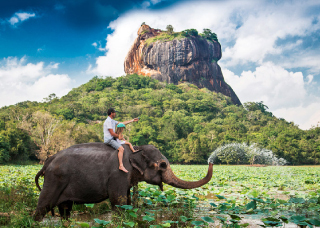 Sigiriya (Lion Rock ) is an ancient palace located in the central Matale District near the town of Dambulla in the Central Province, Sri Lanka. The name refers to a site of historical and archaeological significance that is dominated by a massive column of rock nearly 200 metres (660 ft) high, this site was selected by King Kasyapa for his new capital. He built his palace on the top of this rock and decorated its sides with colourful frescoes.The capital and the royal palace was abandoned after the king's death. Dambulla cave temple also known as the Golden Temple of Dambulla is a World Heritage Site (1991) in Sri Lanka, situated in the central part of the country. This site is situated 148 kilometres (92 mi) east of Colombo and 72 kilometres (45 mi) north of Kandy. It is the largest and best-preserved cave temple complex in Sri Lanka. The rock towers 160 m over the surrounding plains.There are more than 80 documented caves in the surrounding area. Pinnawala Elephant Orphanage is an orphanage, nursery and captive breeding ground for wild Asianelephants located at Pinnawala village, 13 km (8.1 mi) northeast of Kegalle town in Sabaragamuwa Province of Sri Lanka. Pinnawala is notable for having the largest herd of captive elephants in the world. In 2011, there were 88 elephants, including 37 males and 51 females from 3 generations, living in Pinnawala. Sinharaja Forest Reserve is a national park and a biodiversity hotspot in Sri Lanka. It is of international significance and has been designated a Biosphere Reserve and World Heritage Site by UNESCO.The hilly virgin rainforest, part of the Sri Lanka lowland rain forests ecoregion, was saved from the worst of commercial logging by its inaccessibility, and was designated a World Biosphere Reserve in 1978 and a World Heritage Site in 1988.